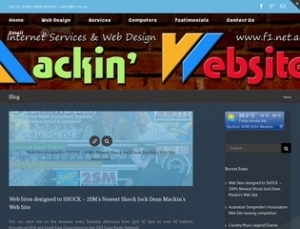 Please CONTACT Dean Mackin if you would like an Uber Cool, Modern and FUNCTIONAL Web Site designed to YOUR specifications. eCommerce (Online Stores), Musician and Radio Station Web Sites are a specialty of ours but there is no job too big or too small. Call Dean today on 0409 240660 for an obligation-free quote and to discuss the direction and POTENTIAL of your business ONLINE.